According to all weather forecasts it was supposed to be mild, but not to warm (for Canadian standards) today. We conceived a plan to follow Icefield Parkway up north, all the way down to Weeping Wall and see what’s up there. It’a long drive (for our standards), almost 200 km one way, so we packed enough supplies in case we decided to stay overnight. Unfortunately we woke up to 20 cm of fresh snow… They all lied. Damn you weather people! That pretty much guaranteed that the road will be un-accessible. We decided to go as far as Lake Louise and decide then. The HW1 just before Banff. 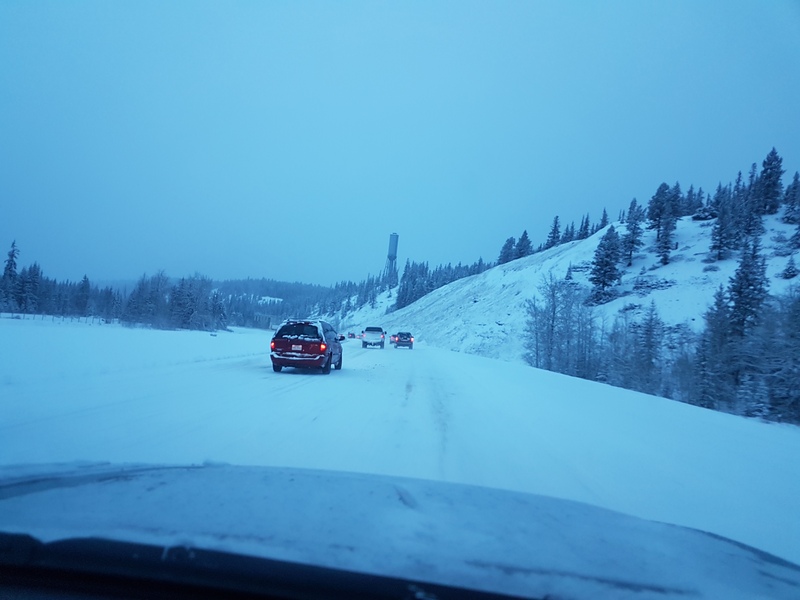 The moment we joined the highway it was clear that it will be a Lake Louise only drive. We pulled over for a quick cup of coffee and voted to stay and do the Lake Louise Falls again. The route we have already done last week (at -15C then) was in quite heavily snowed in condition, but definitely by far the safest one around. It was also much warmer this time round, with temp around 0C. 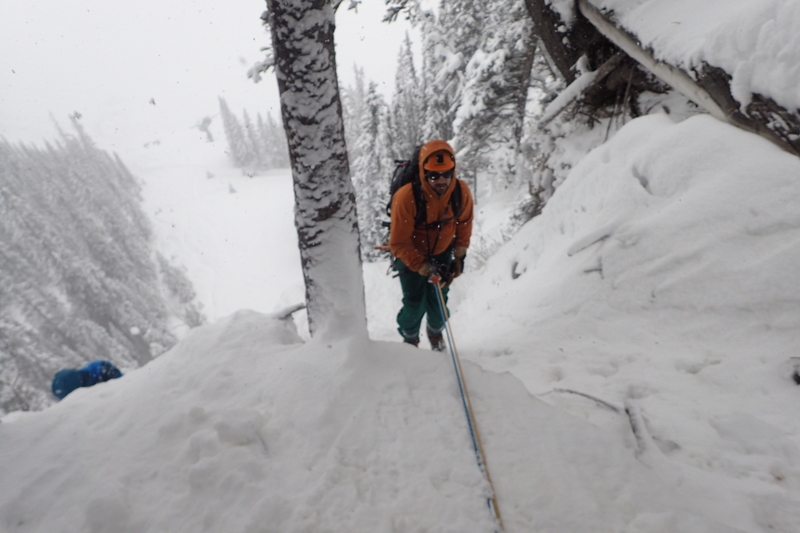 There were 2 main concerns regarding climbing it today – some snow accumulation on the trees above, that potentially could swipe a leader out, and the descent gully, that was definitely out of bounds today. 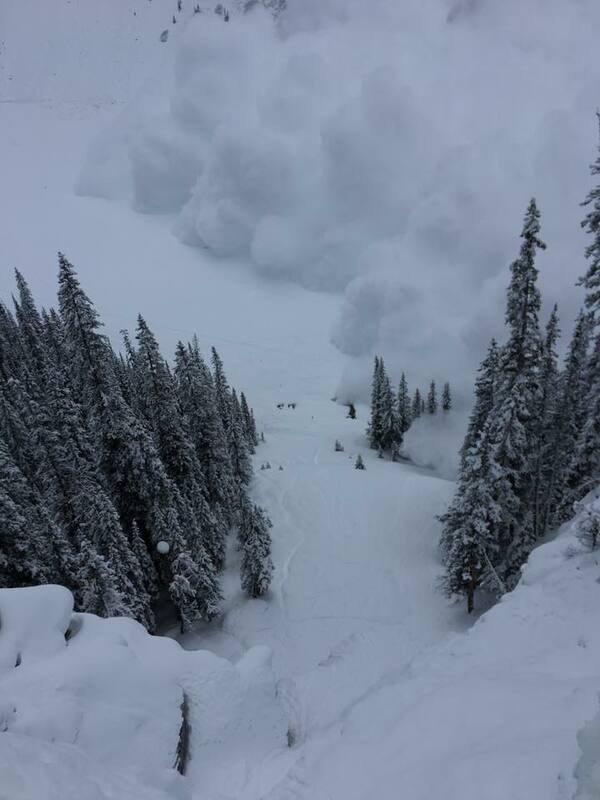 The mountain across the lake is very avalanche prone, but as long as u keep to the right hand side of the lake (away from the danger zone, as the signage suggests), you should be ok.
As a matter of fact the avalanche came down there just before we arrived. One of the guides from Rockies Ice and Alpine Specialists Inc. who was on the climb before us managed to capture the glimpse of it on video. You can check it out here. For reference he was in the ‘cave’ (pitch 3) when shooting the video. What you see is the snow& derbies ‘bouncing ‘off the lake and going back up towards him. Anyhow by the time we arrived to the base it was all settled and I quickly racked up and claimed pitch 1. Since we’ve already done the middle line (5 days ago) as well as right line (last year) – I choose the left one. As I already mentioned it was pretty snowed in (the base of it had knees deep snow, with loads of snow on the route itself), but it was still a lot of fun! I ran it some 30m to tree belay on the left. The boys followed. Lar grabbed the 2nd, even more snow covered pitch. Not much fun when you don’t know what you are climbing on. 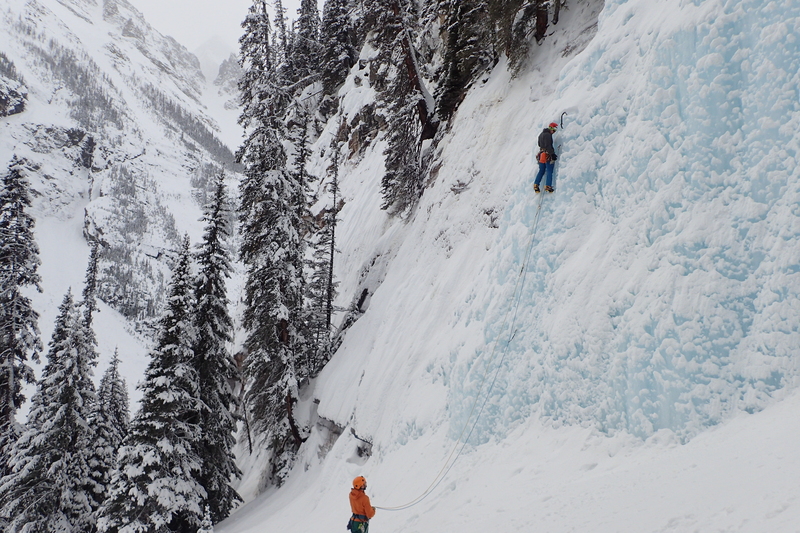 He disappeared behind the rock feature pretty quickly and took a while to find some decent ice to setup a belay. As it turned out later there was another tree belay just 5m above. Can’t blame him though – it was covered in snow. The other option was to run it out to the left hand side cave entrance, but I guess after we gave out to him last time for running out a pitch he wasn’t going to go through that again. We quickly caught up as soon as the ropes went tight. Quick swap-over and I was on the sharp end again getting us to the cave (left hand side entrance). It was there where the game really started. The crux pitch. Steep as they get. PG wasn’t overly excited, but he delivered, as usual a stellar performance all the way to the top tree belay. By that time it was heavily snowing again. I went out first and Lar followed shortly after. 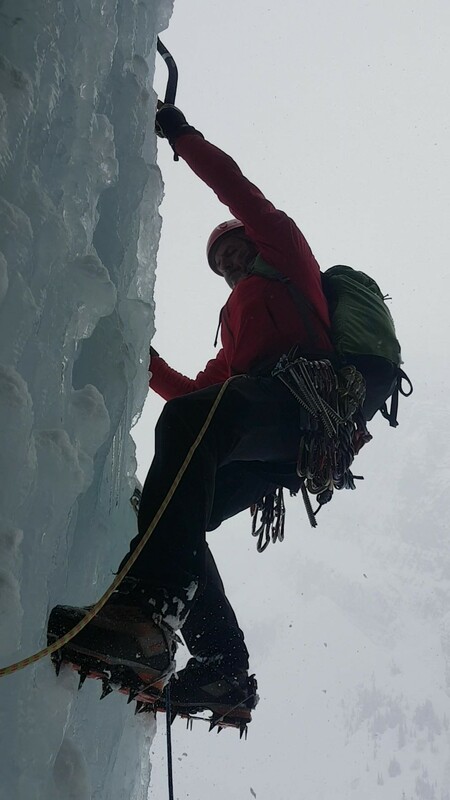 I must say though that the traverse out on steep ice in low visibility is quite intimidating (and I was on a TR!). We all made it ok to the top and 2 quick abseils got us to the base. 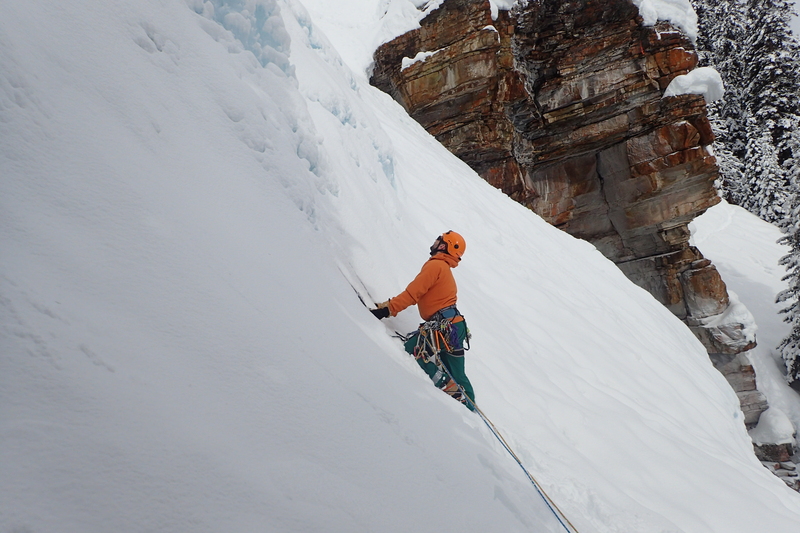 Normally climbers walk off to the climber’s right via a snow gully, but as I said before, there was so much snow that i would have been unsafe. Lar on the way down. Unfortunately the forecast are still not favorable, with most climbs we wanted to do not accessible, with either closed roads or high avalanche danger. This pretty much means our ice climbing adventure has come to and end prematurely (with 3 days to spare, we are flying back to Dublin on Monday, 20th).